As his parents were general practitioners, Dr Mitesh Sanghavi always had a close relationship to healthcare. “However, the mix of art, science, service and technology that dentistry offers appealed to me the most. Once I got into dentistry, I knew I had made the right choice.” He practices dentistry enthusiastically and loves coming to work every day. Dr Mitesh Sanghavi graduated from Nair Hospital Dental College, Mumbai, India in 2002 with a Bachelor of Dental Surgery. He then attended Bapuji Dental College and Hospital, Davangere, India, graduating in 2007 with a Master of Dental Surgery – Pedodontics and Preventative Dentistry. To further advance his education, he attained a Postgraduate Diploma of Dental Implantology from Charles Sturt University, Orange, Australia, in 2011. He is always taking continuing education courses to stay up to date in the field of dentistry. I wish to change the perception of visiting the dentist in the minds of people and make it a pleasant experience. Dr Mitesh Sanghavi is passionate about being a dentist and finds it gratifying to serve the community at large by providing exceptional dental care. 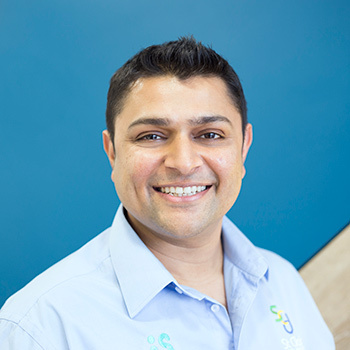 When he’s not helping his patients achieve beautiful smiles, Dr Mitesh Sanghavi enjoys spending time with his kids, travelling and playing sport. In addition to providing general dentistry services, Dr Mitesh has expertise in the following areas: dental implantology (including surgical placement of dental implants, and implant supported dentures); endodontics (root canal treatment); restorative and full range of cosmetic dentistry services (from bridges and crowns to dentures, or combinations of these treatments); and paediatric dentistry. Improve your oral health & enhance your smile. Call today to book a same-day appointment with Dr Mitesh Sanghavi (Dentist)! We’re open late.